WHAT IS A DUVET COVER? A Duvet Cover is a PROTECTIVE Layer that slips over the Duvet Insert, Comforter, or Blanket. Because Duvets and Comforters can be Expensive and Difficult to Clean, Duvet Covers are USEFUL because they protect your comforter during use and are easily removed and EASY TO WASH as needed. Also, You can easily change the STYLE of your bedding from season to season! Our AFFORDABLE, BREATHABLE, Temperature-Regulated, SOFT Luxury DUVET COVER (With Button Closures) and Pillow Shams come in Lovely Colors and 3 Sizes to FIT YOUR NEED (Twin/Twin XL, Full/Queen, King/California King) This Duvet Cover Set is PERFECT for Your BEDROOM, GUEST ROOM, KIDS ROOM and is a GREAT GIFT to give to a LOVED ONE. 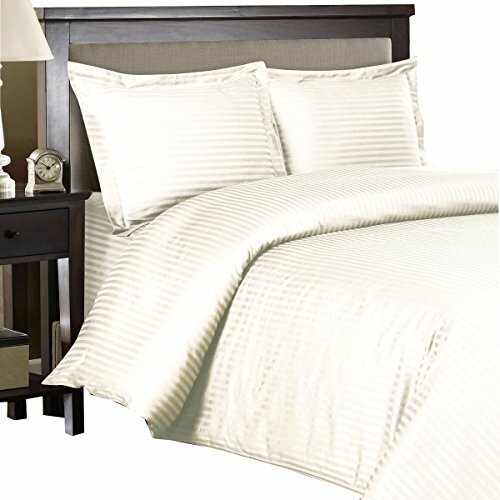 The Bedding Set is 100-PERCENT COTTON and is constructed of 300 Thread Count Single ply yarn with Stripe Sateen Weave Providing SOFTNESS and COMFORT. You can Relay on its DURABILITY with No Pilling. ORDER NOW and AMAZE YOUR FAMILY AND FRIENDS With YOUR BEDROOM DECOR and WRAP YOURSELF IN SOFTNESS! With Duvet Insert (Comforter) Covers, You Can Quickly and Easily Change The Look of Your Bed and Room Without Having to Completely Redecorate!